When I was three I learnt to swim in Hong Kong. My family was posted out there with the Royal Navy and one of the best ways to keep cool was in the water. My confidence in the pool and sea was born more out of necessity than a desire to swim for leisure. Thirty-odd years later I have my own family and we’re living in the UK where the need to immerse yourself to cool down doesn’t happen so often. However, as a water baby myself, I still want my girls to have confidence in the water. In the past year we’ve been going to the swimming pool more often and have tried arm bands with Tin Box Tot to help her be more independent. These made her feel happy to let go of us and float around. However, we noticed they also limited her arm movements, making it more difficult to teach her to swim. So we started to look for other options. That’s when Baby Swimming Shop got in touch to introduce their business and swimming range for kids. 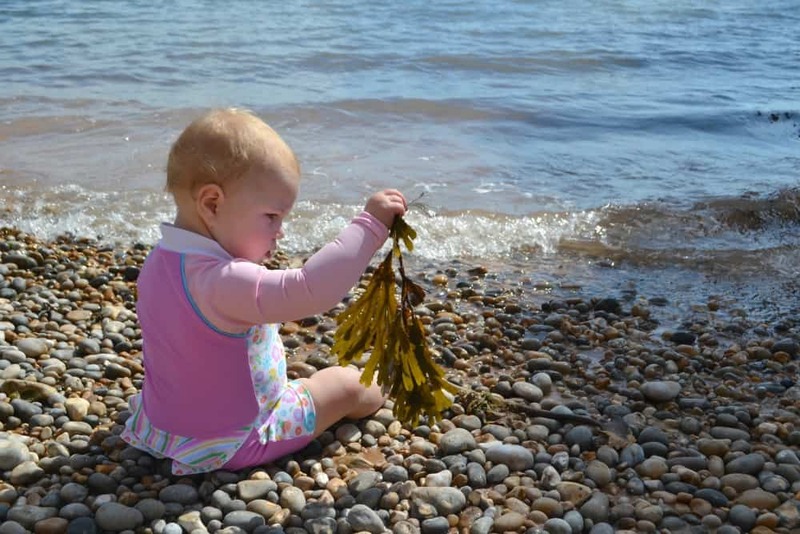 This new online baby store offers a range of swim and beachwear for babies and toddlers. There’s UV all-in-one swim suits, wet suits, beach robes, sun glasses and even swim nappies on the site. Brands available include Boggs, Swimfin, Littlelife and Cuddledry. 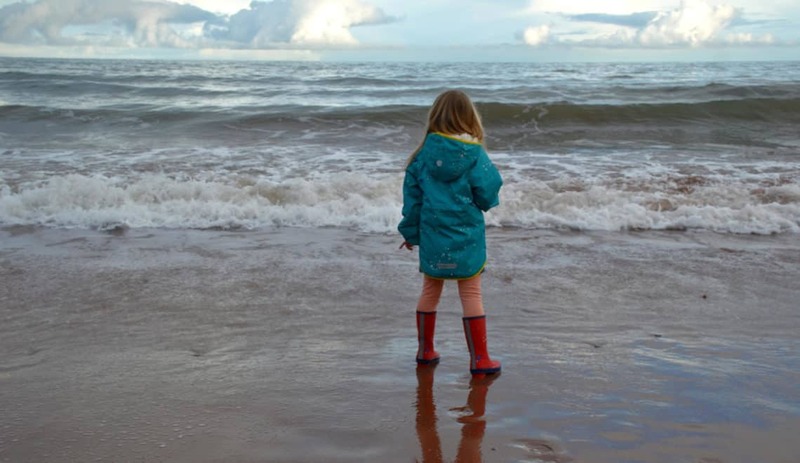 We were spoilt for choice and, with plenty of trips to the pool and beach days planned as part of our summer holidays, we selected a few items for each of our girls. We ordered a JakaBel wet suit for Tin Box Tot, and a Platypus Australia UV swimsuit and a Konfidence float suit for Tin Box Baby. Later on, we also bought a Konfidence float suit for Tin Box Tot. This is such good value for money at £27.95. It’s not just a wet suit, it comes with built-in floats to help give kids more buoyancy in the water, as well as keep them warm with 2.5mm neoprene flat lock material. There’s a ring of confidence around the neck and floats in the main body of the suit. The extra bulk make Tin Box Tot look a little ungainly but it didn’t seem to bother her as she ran up and down the shingle last weekend. Something I particularly liked was that it’s really colourful compared to a lot of wet suits we saw on the beach, so Tin Box Tot stood out in the crowds. I originally bought a size 2-3 suit for three-year-old Tin Box Tot as the next available size was 4-5, which I thought might be too big. However, it was too small. Baby Swimming Shop quickly arranged for an exchange for the larger size that fitted much better with growing room. You can get sizes from 12 months to nine-years-old and up to 30kg. This pretty all-in-one swimsuit is available in six to nine months, nine to 18 months and 18 months to two years. I went for the largest size as Tin Box Baby is a ‘solid’ 15-month-old. It fits very well and will last us into next year. I love the floral pattern – particularly useful when you have a little girl who hasn’t been blessed with flowing locks from a young age. The long sleeves are also great as Tin Box Baby has eczema, which has been flaring up in the hotter weather. Covering her arms really helps. Platypus Australia’s sunsafe swimwear has a sun protection rating of UPF 50+, blocking out at least 97.5% of harmful ultraviolet radiation. This means we don’t need to apply so much suntan cream, which irritates Tin Box Baby’s eczema. Win! Other features I love are the frilly bottom and the poppers in the inseam for easy nappy changes. These cleverly designed float suits have eight removable polystyrene floats inserted in pockets around the waist. The idea is that you can remove a few of the floats at a time as your child becomes a more confident swimmer. There’s three designs, each with a slightly different shape to the swim suit. We went for the blue polka dot suit for Tin Box Tot (her favourite colour) and the pink stripes float suit for Tin Box Baby. Tin Box Tot’s suit has a round neck top and a cute little skirt. Tin Box Baby’s float suit has longer legs. The only thing I don’t like so much about the pink suit was that the material is very light in colour and you can clearly see Tin Box Baby’s swim nappy through it. This would not be a problem with the darker navy blue or fuchsia designs. We used the suits a lot in indoor pools during the summer, but they also have have SPF40+ sun protection, so are equally good for the beach. These float suits are my favourite products from the Baby Swimming Shop because of the confidence they are already giving my girls. Last time we went to an indoor pool, Tin Box Tot was asking to swim ‘all by herself’ and doing a very good impression of Tin Box Dog in the water. It made me a very proud mum. What gives your children confidence when swimming? Disclosure: we were sent items mentioned in this post for the purposes of an honest review. All opinions are my own and those of my family. Floatsuits are brilliant I think- my daughter loves splashing in water but isn’t confident and her floats unit was a transformation. So much easier than having to hold her too!